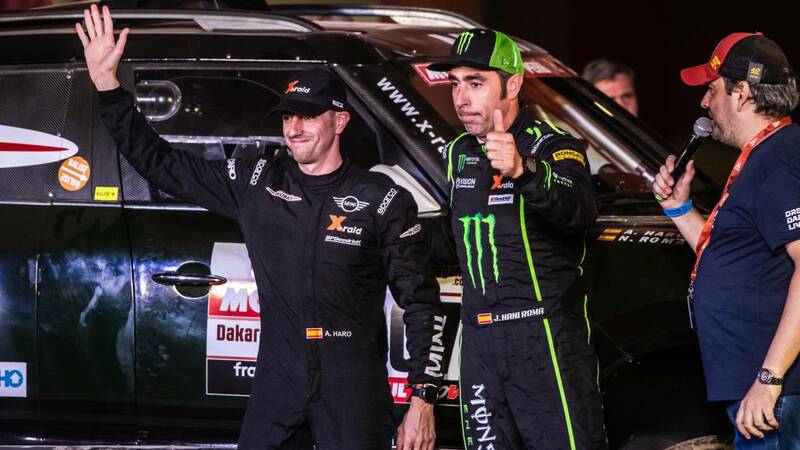 Home Moto Rome: "The hero is Álex Haro, he has a fissure in his ribs"
Rome: "The hero is Álex Haro, he has a fissure in his ribs"
Nani praises his co-driver, who was injured in the sixth stage and has suffered with every hiccup in the Mini to reach the podium. Because Dakar did not have enough difficulties, Alex Haro, co-driver of Nani Roma, lives from the sixth stage with a crack in the ribs as a result of a blow suffered with the Mini. He was diagnosed by the doctor, although until now he has not He had made public, and was Nani Roma himself who wanted to highlight it before As: "The hero is Alex, he has been running four days with a fissure in his ribs since that stage" . "There have been times when I lost time because We could not run more in the potholes, it's exceptional, I know what it's like to have this pain sitting at home, imagine in a race car, I really appreciate what you've done, "says the Catalan on Álex, his co-driver since 2015 With him he has managed to grab this podium, he is second in the Dakar with a big advantage over Loeb, third place, and far from Al Attiyah: "The race is not finished, is a we'll still see if the strategy was good. There is only one ahead, but he has done everything well and if this ends like that, we will only have to congratulate him ".